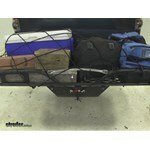 Tie down stretch net helps keep your gear on your trailer hitch mounted cargo carrier. Large hooks are easy to handle while the stretch net works to accommodate most cargo and works with virtually any carrier. Call 800-298-8924 to order Highland cargo nets part number H9500100 or order online at etrailer.com. Free expert support on all Highland products. Guaranteed Lowest Price and Fastest Shipping for Highland Stretchable Cargo Net - 36" Wide x 48" Long. Cargo Nets reviews from real customers. 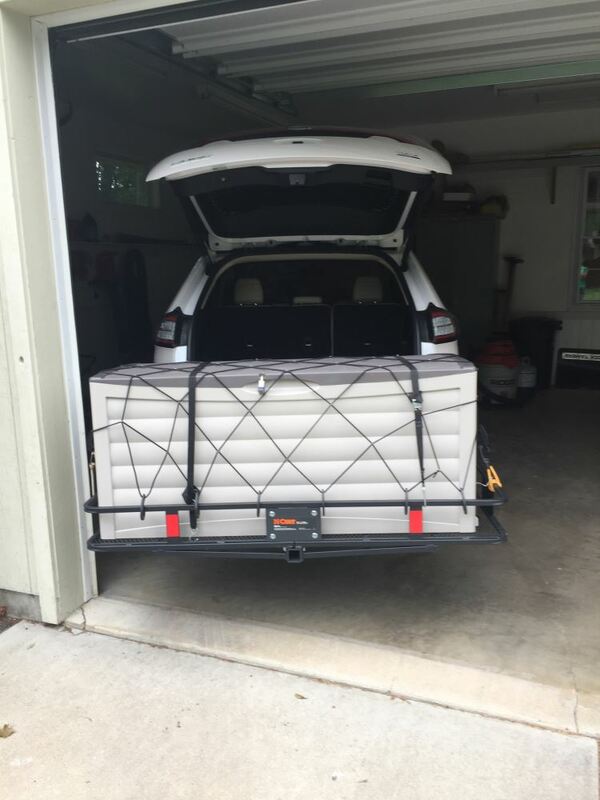 Tie down stretch net helps keep your gear on your trailer hitch mounted cargo carrier. Large hooks are easy to handle while the stretch net works to accommodate most cargo and works with virtually any carrier. 9500100 Highland Cargo Carrier Stretch Net - 36" x 48"
This sturdy cargo net helps control and secure your load. The built-in cinch rope lets you tighten down the net over your freight. Includes 6 carabiners for attaching the net. Designed for long-bed pickup trucks. Weight capacity is 400 lbs. Cargo Net for SportRack Roof Mounted Cargo Basket - 40" x 36"
Erickson Roof-Rack Cargo Net - 36" x 48"
Deluxe Bungee Truck Net 60" x 78"
ProGrip Cargo Net for Full-Size Truck Beds - 80" x 60"
Erickson ATV Cargo Net - 15" x 15"
Today we'll be taking a look at the 36 by 48 Highland Stretchable Cargo Net, part number H9500100. As you can see, our cargo net works nicely with our cargo carrier. It'll also work great for a roof-mounted cargo basket. 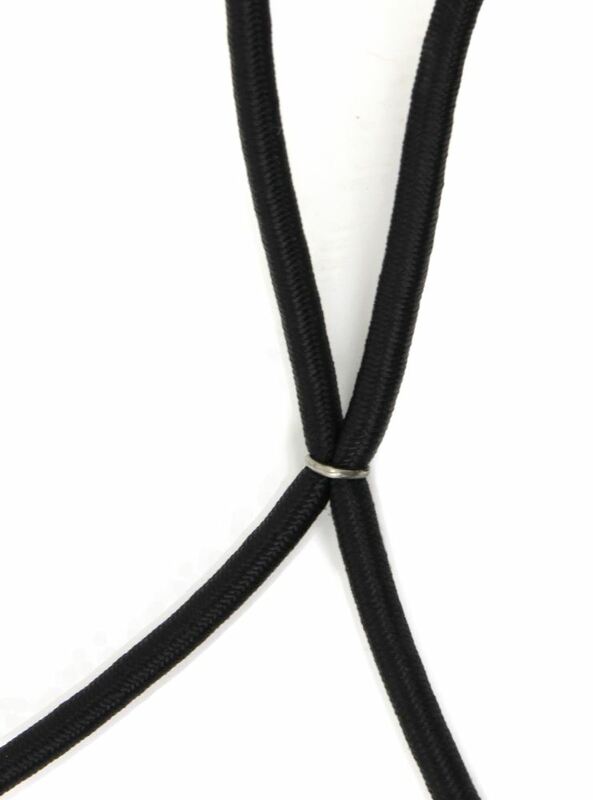 It uses these elastic stretchable cords, which help provide a nice secure and tight fit around our cargo carrier. 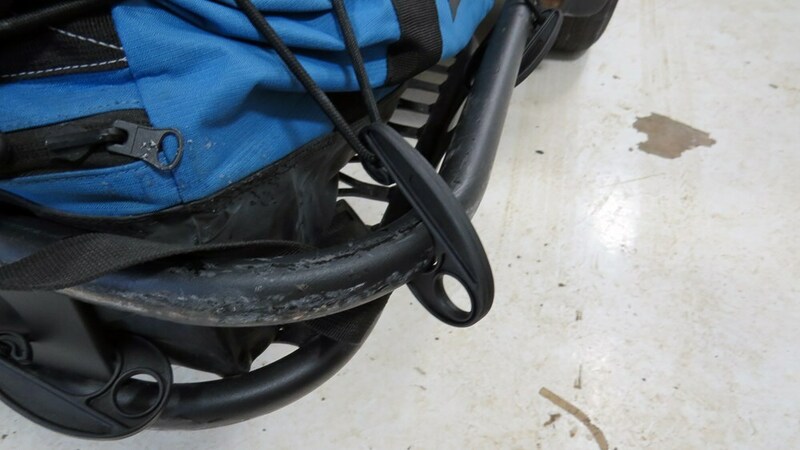 It features these nice hooks, which make it quick and easy to wrap around our cargo carrier. As you can see, we've got one on the outside corner here, as well as one on the inside corner around here. We can simply stretch it down underneath and hook it in place. The hooks also feature a nice finger hole for easily pulling and snapping into place. 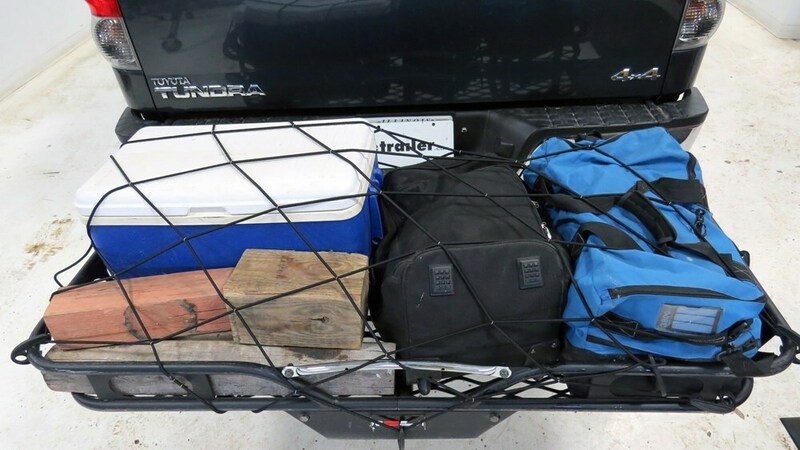 You can see how the elastic cords form nicely around our cargo carrier and onto our bags, as well as our cooler and over onto our wood to keep everything in place. 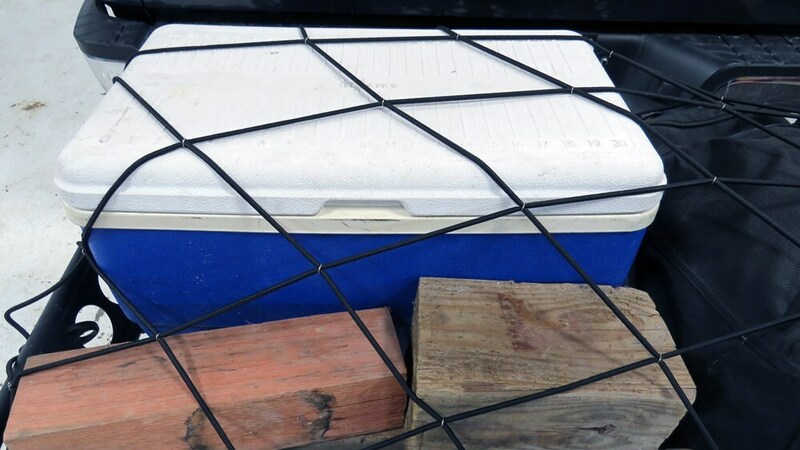 That's going to complete our look at the 36 by 48 Highland Stretchable Cargo Net, part number H9500100. .
Order: RelevanceNewestRating - High to LowRating - Low to High Tie down stretch net helps keep your gear on your trailer hitch mounted cargo carrier. Large hooks are easy to handle while the stretch net works to accommodate most cargo and works with virtually any carrier. Still using the cargo carrier...no complaints expect I dont think I needed one so sturdyheavy...a medium weight one would have done. 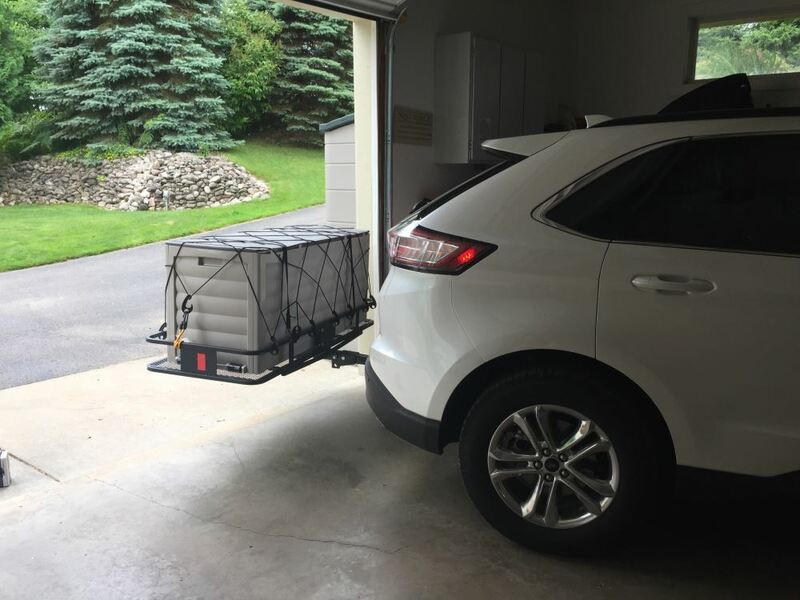 I am happy to report that all of the products, hitch, cargo basket and cargo net, that I purchased from you all are working just great, and in fact just used everything last week on a family trip to the beach. For the Curt Cargo Carrier part # C18153 that you referenced you have a couple options. You can use a stretchable cargo net like the part # H9500100 and/or you can use a ratchet type strap like the # EM34415. I attached a review video for you to check out that shows how ratchet straps are typically used. For the ultimate in cargo control I would recommend using both, but just the straps would work fine as well for larger items. The cargo carrier part # CC-100 has a platform that is 23 by 60 inches. As long as you secured the bikes adequately to the carrier you would have no problem carrying them. For a cargo net you could use the # H9500100 and/or for straps the # 05605. Check out the review video I attached. 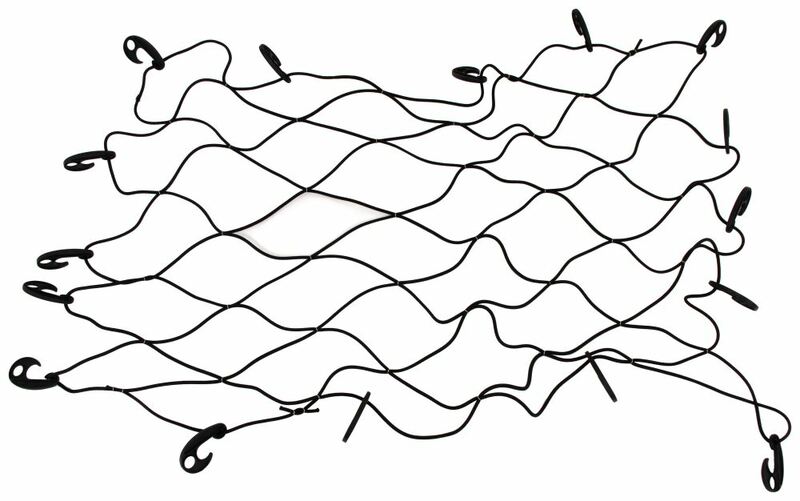 For your application, I recommend the HitchMate StretchWeb Cargo Net with Hooks - 4' Wide x 6' Long # HE4254. This net has removable hooks that attach anywhere for ultimate versatility. This will allow you to have a custom fit for every application in your airplane cargo area.